At the Last Supper, in addition to giving these magnificent teachings, Jesus also washed the Apostles’ feet. 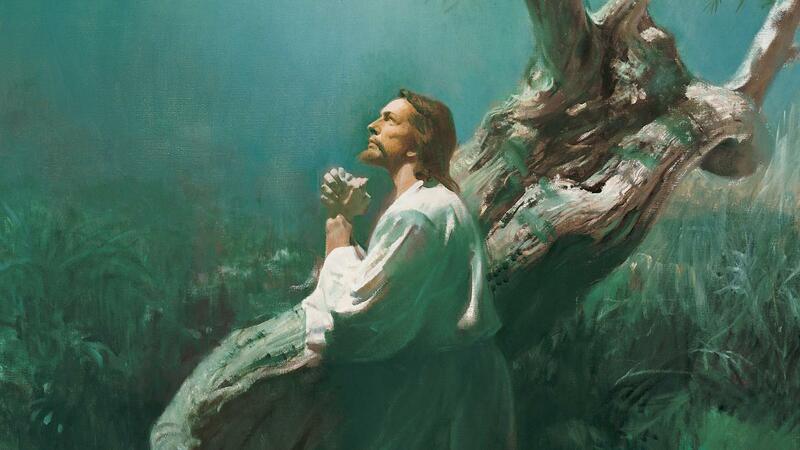 He also gave his magnificent Intercessory Prayer, where He prayed for them, and for all who would heed their teaching. From the gospels of Matthew, Mark and Luke we learn that the Savior also instituted a new ordinance on this occasion – the Sacrament. (Matthew 26:26-28; Mark 14:22-24; Luke 22:19-20). Christ broke bread, blessed it, and gave it to His Apostles, telling them that it represented His body which was given for them. They were told to eat it in remembrance of Him. He then took the “cup after supper” (which traditionally was a mixture of water and wine), blessed it and gave it to them. They were told that it represented His “blood of the new testament, which is shed for many for the remission of sins”. The Apostles were told to “drink ye all of it”. At that point in time, His body had not been given for them, and His blood had not been shed for the remission of sins. But the giving of His body and the shedding of His blood would happen very shortly thereafter. Jesus and His Apostles, except Judas, left the Upper Room, went out of Jerusalem, crossed the brook Cedron and ascended the Mount of Olives to a place called Gethsemane. There Christ went by Himself and prayed to the Father. The burden of all of the sins of mankind was placed upon Him, as well as all of mankind’s pains, afflictions, temptations and sicknesses. See Alma 7:11-13. The burden was so great that the Savior prayed that, if possible, the cup would pass from Him. But, He did not shy away from what the Father required of Him for a perfect and infinite atonement. His prayer to have the burden removed included, “Nevertheless not my will, but thine, be done.” Luke 22:42. Doctrine and Covenants 19:18-19 (emphasis added). While yet in Gethsemane, Jesus was arrested by the Jewish temple guards and the Roman soldiers. The shedding of His blood continued as He was beaten, scourged and ultimately crucified at Calvary. After much suffering, both of body and spirit, He willingly gave up His life, offering His body as a sacrifice for our sins. He was laid in a borrowed tomb, and on the third day He rose from the dead, initiating the resurrection of all mankind. Each Easter the Christian world celebrates Christ’s resurrection and the victory over death that it entails. We also remember during the Easter season the events preceding His death and resurrection, including His teachings, the example of His life, and His suffering in Gethsemane. However, Easter is not the only occasion we have to celebrate Christ’s atonement. Each week, by the Lord’s invitation and commandment, we gather in Sacrament Meeting to commemorate the Savior’s atonement. Just as the Apostles did at the Last Supper, we take the broken bread in remembrance of Christ’s body given for us. We drink the cup remembering His blood that was shed for us, and further remembering that He drank the full measure of the bitter cup that was required to save us from sin and death. Easter is a wonderful celebration of the atonement of Jesus Christ, but so is each Sunday as we come and partake of the holy Sacrament offered to us in each Sacrament Meeting. Let us come each week with broken hearts and contrite spirits and celebrate Christ’s marvelous victory over death and sin.